Very frustrating at the moment. Whilst in Morocco I managed to stab myself with a broken mast. It left a big hole and a load of carbon splinters and took about 2 hours to get all the bits out. 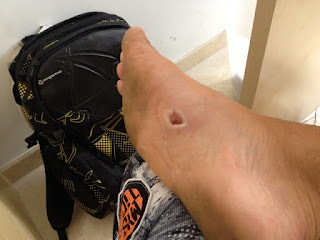 Luckily its on the arch of the foot and in Morocco (starboard tack) I could sail 100% fine. Walking was painful, but sailing was perfect. Unfortunately switch to port tack and its now my back foot when jumping and its absolute agony. Basically if I land a jump well I get rewarded with a massive shot of pain! As you can imagine in Pozo, there is quite a lot of jumping, especially when its 3.4 weather. Yesterday I came off the water early as my sailing was going backwards and I think it need a few days rest to recover. Very frustrating as everyone is out here training at the moment and the conditions have been going off. Luckily the wind looks like it will never stop blowing, so still plenty of time for some training.